Marginal Revolution reports that interpreting the monetary base under the new monetary regime. Krugman's interpretation, however, neglects the fact that the monetary regime changed when the Fed began to pay interest on reserves. Previously, holding reserves was costly to banks so they held as few as possible. Since Oct 9, 2008, however, the Fed has paid interest on reserves so there is no longer an opportunity cost to holding reserves. The jump in reserves occurred primarily at this time and is entirely under the Fed's control. The jump in reserves does not represent a massive attempt to increase the broader money supply. Today, the banks are no longer in bullfrog mode. The Fed is paying interest on reserves and they are paying at a rate which is high enough so that the banks have plenty of reserves on hand during the day and they keep those reserves at night. Thus, all that has really happened - as far as the monetary base statistic is concerned - is that we have replaced daylight credit with excess reserves held around the clock. The change does not represent a massive injection of liquidity and the increase in reserves should not be interpreted as evidence of a liquidity trap. My reaction: Alex is right that people are misinterpreting the recent increase in the monetary base, and he is also right that paying interest on excess reserves is key to understanding what is going on. However, his argument is incomplete. Once the fed started paying interest on excess reserves, the line between treasuries and reserves became blurred. In addition to being cash deposits redeemable on demand, excess reserves also became an interest bearing asset. In fact, interest paying excess reserves are currently the most attractive, low risk asset available. The next best thing would be the 1 month treasury, which is (currently) inferior in every way. 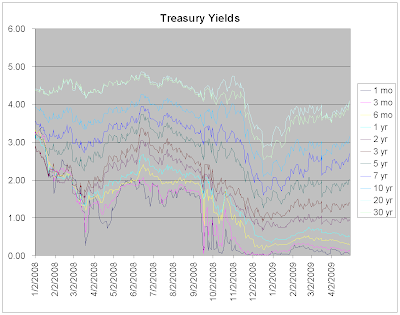 Although small, 1 month treasuries have default risks and interest rate risks. In comparison, excess reserves have zero default risk and (currently) pay higher a higher interest rate. This can be seen in the graph below. As long as interest rates stay below the .25%, excess reserves will remain the preferred short term investment of depository institutions. Right now, excess reserves should be considered sterilization bills (like those sold by China to control money supply). It would therefore be more accurate to think of excess reserves as 800 billion worth of short term treasuries (and part of our national debt) rather than part of the US monetary base. However, if interest on the one month treasury starts rising above the .25% paid on excess reserves, the situation changes. A higher yielding one month treasury would become a more attractive alternative to excess reserves and banks would start turning to them as their preferred short term investment. This would quickly lead to money printing. 1) Do nothing. This would quickly lead to printing, because a higher yielding one month treasury would become a more attractive alternative to ex cess reserves and banks would start turning to them as their preferred short term investment. 2) Raise the interest rate paid on excess reserves. This would temporally keep excess reserves as the most attractive short term investment, but would become increasingly expensive as short term rates climb. 3) Buy short term treasuries to keep rates below .25 percent. This would undermine confidence in the dollar by expanding the fed's balance sheet and would lead to the monetization of the US national debt. Several people have asked what excess reserves imply about the velocity of money. However, I don't believe that really applies here. As I said above, as long as excess reserves are paying more than 1 month treasuries, they should be considered part of the US's national debt, not money supply. The day when short term rates head up is getting closer. Already, long term rates are beginning to break upwards. This entry was posted in Background_Info, Currency_Collapse, Federal_Reserve, Financial_Wizardry, Wall_Street_Meltdown. Bookmark the permalink. Eric I don't see how your option 1 (Do Nothing) implies "The printing". Hyperinflation? Excess reserves cost the federal reserve interest. If yields on 1 month US treasuries rise beyond the interest paid on excess reserves (according to your argument) money will flow out of excess reserves into US treasuries. But this flow of money will increase the demand on those treasuries, so their market price will go up, and their yield will tend to drop. This is a negative feedback mechanism. The US government would be happy for money to flow into US Treasuries, I would think. Yields would stay low. Hey Eric, love your blog man, keep up the good work. Now can you post a reply to this article. It's about why hyperinflation WILL NOT OCCUR IN THE USA. I'm a amateur when it comes to finance and economics so I was wondering if you can post a rebuttal to his article. After reading it he did have a strong case. Regarding hyperinflation, I would like to comment on that myself, but I do hope Eric answers also. Housing prices are a deflating bubble, they were unsustainably high anyway. Lots of bubbles are deflating. These are not relevant to hyperinflation overall, because US consumers are not going to fuel the hyperinflation anyway. Here is the key: The US government has become a giant parasite, sucking money out of the world in order to feed itself. It has 3 ways of acquiring this money: 1 = taxes, 2 = borrowing, 3 = printing the money. Taxes are out of the question, the economy is collapsing. Tax revolt is ongoing. So forget taxes. Borrowing is also impossible these days. China has stopped buying US treasuries. The world doesn't trust the US will be able to pay off its debts with dollars of equal value as those that were lent to it. So the money spigot for borrowing has dried up. So the US government must continue spending, but no money is available. Answer? US government issues US treasuries, the Federal Reserve buys them. Dollars are diluted. US government continues operations. This can go on only so long before people around the world start panicking and wanting to get rid of their dollar hoards. The US dollar, being the world's reserve currency, implies people are hoarding them as a store of wealth. Once they fear losing their purchasing power, they'll start selling their dollars. This will fuel the run on the dollar. Everyone around the world will be in a rush to exchange their dollars for things of real value. So everything, priced in dollars, will skyrocket. Dollars will collapse in value. Hyperinflation. End result is US economy in shambles. The US government will cease operations. And the US dollar will be worthless. All federal programs will be defunct. Social security, medicaire, medicaide -- no money there. So tough luck if your livelihood depended on US government largess. The anti-hyperinflation argument offered, especially by Mike Shedlock, is that hyperinflation will be fueled by the cash strapped US consumer who is unable to spend due to rising unemployment and maxed out credit. But this is a straw man. The US consumer will not be the one triggering the hyperinflation. It will be the US government and the rest of the world. slightly off topic Eric but I couldn't find your blog entry "who's manipulating gold? " and I came across this article this evening that may have the answer. I thought you might be interested if you haven't read it already. dashxdr: amen. The deflationists are always looking for a transmission belt between money supply and wages. What they miss is that huge inflations are dually a gov't phenomenon: they print the money and spend it. i don't give compliments to economic bloggers that easily case in point i would like to hear your opinion on Dashxdr's disagreement that your option number one would lead to hyperinflation....but good article none the less. Eric did an entry in February 2009 about a new currency, the Khaleeji, backed by the gulf countries that will replace the dollar used to buy oil sometime in 2010. That will break that petro dollar pillar. - My book on Super-Imperialism (new ed. 2002) and other writings have explained how the United States has financed its domestic federal budget deficit by running a balance-of-payments deficit (largely on military spending) that floods the world's central banks with surplus dollars. These foreign central banks have little they can do with these dollars except to buy U.S. Treasury bills. If they do NOT recycle these dollars in this way, their currencies will rise and hence price their exporters out of world markets. This is their dilemma. - The solution is a dollar-free international financial system, where payments deficits and military spending deficits are settled in "real assets" rather than U.S. Government IOUs. The problem is that half of U.S. discretionary Government spending is for military purposes. Thus, the global financial system rests on foreign countries financing U.S. military surrounding of them and covert military operations to fight and overthrow governments and undertake "color revolutions" (bordering the former Soviet Union) and even finance political corruption and massive assassination programs against any countries and leaders that would seek to free themselves from this dilemma. - That is why, when my book first came out, the largest purchasers were the CIA and Dept. of Defense, who used it as a how-to-do-it book to get a free ride from foreign countries, and gave the Hudson Institute a large grant to explain to them just how the free lunch worked. - You use the word "parasite." A parasite not only taps the host's blood for its nourishment, but also takes over the host's brain so as to protect the free luncher. In this case the aim of taking over the "brain" of foreign central banks is to convince them that they need the dollar and that there is no alternative. This is of course nonsense. - Re your example, the effect of the U.S. bailing out the financial sector and running deficit is to increase ASSET prices, not wages and consumer prices. These sets of prices are not symmetrical, although monetarist textbooks only talk about consumer prices, not the price of wealth. The outlook for the U.S. economy is price and wage Deflation, not inflation. So the problem you pose won't affect Iceland. What is you comment on this?! I wish Eric would look at these comments and make his own replies. I believe any "analysts" that look at the situation and convince themselves that deflation is coming are deluding themselves. There is a common inability to imagine the end of the US empire, the end of the dollar. The theme seems to be, "Oh my god! I'm completely unprepared for a dollar collapse. Therefore it can never happen!" Someone said the Federal reserve can simply buy up the US treasuries, for some years to come. Where does the Fed get the money for this? They create money out of nothing, that's how. That's called monetizing the debt. And it's very inflationary. It dilutes all other dollars in existence. The US treasuries are a form of "money" themselves. But they'll collapse along with the dollar. People will be dumping them trying to get rid of them. Treasuries are a promise to pay dollars in the future, meanwhile they pay interest. But if the dollars collapse, the treasuries must collapse in lockstep. How does all this affect Iceland? Fiat currency countries are all in a bad way. Truly the US empire already is a global power, the central banks control all the major countries. In order to prop up the dollar and keep their exports going they print their own currencies, thus devaluing them. Their own people suffer massive inflation in order that US is able to print dollars and enjoy deflation! Ridiculous if people assume this will go on forever. The world will wake up to the fact that their own governments have been corrupted by the US and the banking cartel. And they'll say, "No more!" and they won't allow their own governments to continue printing money. It will all come down to the true strength of countries' economies. Do they produce real goods? Do they have natural resources? Things of value to export? They'll be fine. The US which is a consumer / service based economy whose main export is the dollar will be wiped out. Yes countries will suffer reduction in exports in the short term, but the big exporting countries themselves (like China) will become consumers. The artficial suppression of their own currencies will end and major exporters will find their own currencies are extremely valuable. The dollar is being moved off to the sidelines, slowly but inexorably. It is going to collapse to zero value. So many problems beset them. I like silver by the way. Some questions about precious metals. Please correct and comment. Gold: mainly a monetary metal, rarely useful in the industry. Compared to silver, platinum and palladium, gold is overvalued. Possible huge price drop after the economy stabilizes or recovers. Gold is likely a short term store of value. Silver: both monetary and industrial metal. Offers good value. Probably keep its value if and after the economy recovers as there is not much above ground for industrial application. Palladum and platinum: mainly used in the automobile industry, not so much for jewellery. Currently undervalued compared to gold. Their prices could recover a lot if the automobile industry recovers. However, I don't see many reasons for the recovery of the auto industry. Oil could become very expensive again and soon. Americans just can not afford more cars. They are broke. Maybe a lot of car buying in India and China? Those countries are too crowded to have many cars, I believe. If we have some green paper and would like to get rid of it, what metal would offer most value for long term investors (or long term savers)? My belief is that gold is not for buy and hold savers. I am not a professional investor and have no time/skill/interest to trade much. Ideally I would like to keep PM for decades until my retirement ( as a savings vehicle instead of investment). I don't know what kind of PM I should buy ( but I am determined to get rid of all my junk green paper soon). Please advise. This is my response to the anonymous question about which PM's to buy. The assertion that gold is overvalued is rubbish. Look at gata.org and Ted Butler's archives, these people know and have known for a long, long time that the gold and silver prices on COMEX, NYMEX, etc are ridiculously manipulated downwards. In a free market situation both would have been much, much higher than they are. But the fiat currency system cannot allow the monetary metals to rise because that would expose the valueless nature of paper that can be printed on government whim. One cannot look at the charts of gold and silver and divine the future. The fundamentals are being swamped out by the market manipulation. Volcker lamented in the 70's and 80's that his biggest mistake was letting gold get out of control during the period of high inflation. So what did the Fed learn from this? Don't let gold rise. OK, they do this by having unlimited paper dollars to throw at the problem. They sell short gold on the COMEX markets and expect to take a beating holding a huge short position. Paper dollars cost them nothing. Their goal is to prevent gold and silver from rising, and attracting long term investment money -- at which point they'd be unable to control the prices. It's a propaganda campaign against gold and silver. In a free market situation gold might be 1:1 with the DOW. That happens all the time in the last 100 years. It's a normal level for stocks and gold to be at. We're heading there again. Silver would be back in its normal 15-20 range underpriced per ounce with respect to gold. It's near 1/70th of gold right now. Ridiculous! Silver is both a monetary metal and it has massive industrial uses. Silver is probably the best, safest investment on the planet right now. Read Ted Butler! Gold will rise, a lot. Silver will rise even faster, because it is even more undervalued. I don't follow the other precious metals. My plan is to ride silver up until it's back where it should be, then convert a lot of my silver to gold, and remain in gold for a store of wealth. I might sell gold to buy real estate and rental properties when those have bottomed. GLD is not gold. It's fraud. I don't trust SLV either. COMEX is a joke, a paper game. If you want precious metals, order physical metal and take delivery and keep it safe yourself. Precious metals you don't control are too often just a paper sham. Gold is an excellent store of wealth especially because it has so few industrial uses. There is so much of it! Any new mine coming online has almost no effect on the gold price. The stuff lasts forever, and doesn't rust. Perfect substance for the backing of currency. Oil -- headed higher. There is no getting around it. The world is running out. As US consumes less, the rest of the world will consume more. China, India, Russia, they all want the good life. 2 cars and driving for pleasure. And they're going to get it. Oil is used in everything, mining, transportation, fertalizer for farmers, electrical power generation. And we're running out of it. The $50 oil target is US economic warfare, an attack on Russia specifically because Russia humiliated USA in the Ossettia / Georgia conflict. The USA military was too overburdened to respond to Russia so the USA did the next best thing -- take down oil, pop that bubble, and that devastated Russia and Mexico and other oil exporters (Venezuela). Mexico was just an innocent victim, the USA certainly likes them. But Venezuela was a freeby. The propaganda paints this economic collapse as a worldwide one. It's USA/UK centric, and THEY are trying to pull everyone down with them. "We're all in this together, guys!" But it's not true. US demand for world resources does not create a viable world economy. The IOU's USA gives in exchange for things of real value are valueless. Monopoly money. The rest of the world is waking up to reality. It's unstoppable. As a US citizen you can protect yourself. You can't protect all americans, so don't even try. If yields on 1 month US treasuries rise beyond the interest paid on excess reserves (according to your argument) money will flow out of excess reserves into US treasuries. Well you are right: money flowing out excess reserves will hold the down the yield on 1 month treasuries, but this last only until banks run out of excess reserves. After that, 1 month treasury yields will keep heading up. 3) The money flowing out from excess reserves goes into the US Treasury. I don't see how your option 1 (Do Nothing) implies "The printing". Hyperinflation? If the fed does nothing, the 800 billion excess reserve, which are funcitioning like short term treasuries (not part of monetary base), will start flowing out into the economy via government spending (becoming part of monetary base). So unless the fed buys short term treasuries or raises interest payments on reserves, these 800 billion excess reserve will quickly be "monetized". Remember, the US monetary base was around 280 billion last december. "Remember, the US monetary base was around 280 billion last december." OK, I get it, the money in excess reserves is like a buffer. Sort of a leading indicator. As that starts depleting, the Fed + US Treasury start running out of options. When it's gone, there is no other magical source of money to keep buying US Treasuries other than the printing press. Thanks for your insight, Eric. I love it when I'm wrong (sometimes)! Sky rocketing prices are inevitable and the govt. 's printing press is in fact stalling prices from rising high. The govt's printing press is the unblocked window in the burning house you are in. Don't waste, time. Act now and buy what you need immediately. Get to that window before the flames cover it. The govt. can only keep the flames from blocking that window for so long. But even if you don't(and get caught in the credit collapse without any gold/silver or things of value), you'll still have a prosperous future as you'll now be working and recieving gold/silver and will be able to retire allot earlier than you would if you continued to get paid in US dollars. So celebrate! The end of the vicious entity that has been halting the progression of humanity called "credit/banking" is near it's end and humanity will be able to resume it's progression that has been halted since the inception of the world wide acceptance of credit/banking. Read my previous replies in differen't posts by Eric. Check out my football analogy in this link above. 1. A great credit contraction is in fact hyperinflation. 2. Contrary to what many believe, all these bailouts and all the Fed Notes being printed is what is keeping prices from rising high as "The only reason prices aren't high right now is because instead of these companies coming to the customers for the money they need, they are going to the govt. through these bailouts." Subsidies, bailouts, it's all the same. It's to keep prices from rising. 3. Massive Defaults are inevitable without Zimbabwe size US dollar bills being created and implimented in these bailouts because we have over $1 quadrillion of debt deleveraging and the debt deleveraging is removing $100 from the money supply allot faster than the govt. can print $100 Bill Fed Notes. 5. The Free Market is "free" and is always working even through communism. 6. Because of Credit causing a shortage of producers, the earth is ripe for picking with hundreds of years of oil in the earth, plenty of silver, more gold and allot of other goods credit has halted us from bringing up out of the earth. Maybe I should start my own blog. Numonic: Celebrate the collapse of credit/banking as it will be the beginning of a prosperous world. I disbelieve at this point. For me it rather seems government/bankers are going to threat people to maximum. They are sucking all the wealth from the people for themselves. Even in those unprecedent days! Poor becomes poorer and rich becomes richer. As people will be trapped in poorness, the same bankers/government will come to "save" threaten people and start "new world" from a scratch. Unbelievable. But people act as sheeps and will follow their "leadership". Most of the bankers/government should be jailed already, but expects anyone it is going to happen? Unless someone respectable will shout so loudly till many people will join him: that's the only chance for better world i can see. Stibot, i disagree. The fallacy of many people is that the change will come when people are willing to make it happen. This is wrong. Credit isn't contracting because people have decided to stop putting money in to these stocks/bonds/debt, credit is contracting because the ratio of debt to actual physical paper currency reached a breaking point. This isn't some mass awakening, it's the inherent self destructive nature of credit that is causing credit to collapse. Now credit will collapse and there is nothing anyone can do about it and we should celebrate it for all the reasons I've said. It's your choice to either hold physical gold/silver in your own secret personal keeping now as gold and silver is extremely cheap to what it will be OR you can choose to work for the gold/silver in the near future when credit collapses and it is allot harder to get the gold and silver. Either way you will be prosperous, it's just that if you take advantage of the extremely cheap price now, that early retirement that you WILL(and i say "will" because it is a guarantee that you will be prosperous) have from the credit collapsing, returning gold/silver to being used as currency would come earlier if you get the gold and silver now rather than later. Either way you'll be prosperous. Communism/Dictatorships do now last. This credit crisis is proof of that, as we have been living with communism/dictatorship for decades under the name of "Credit/Banking". Banking is Communism. Communism is price fixing as is Credit. Price fixing is looting. Looting causes shortages. Shortages end price fixing. We are headed for prosperous times. Celebrate, and if you want to get an early start to your prosperity buy some physical gold and silver now while it's cheap. That being said, anyone that plans on retiring in the near future(i.e next 3 to 5 years) really needs to be stacking up on gold and silver now because at least those that are young and can still work for another 20 to 30 years can continue working and retire at an earlier age than their parents(who were getting paid in paper currency instead of physical gold/silver). The elderly who don't have any physical silver/gold now and plan on retiring in the next 3 to 5 years will have to wait a while unless thye have siblings or someone willing to take care of them. But the next generation will retire earlier than the previous retiring generation as the next generation will be getting paid in gold and silver which will be appreciating more than the paper currency the generation before them recieved. If you factor in that the next generation will have to take care of the previous retiring generation and say that that may hinder the retiring of the next generation, i'm sure that the value of gold and silver will go up enough to take care of the past and future generation. That's why i say we are headed for a prosperous future. Numonic, you assume anyone can buy gold/silver now so he will pass collapse and enter after era with advanced start possition. But do you think it is possible? Do you believe ANYONE can hoard gold/silver at these days? It is not simply matter of occasion. I suppose most of the people will be left without PM. Will be left poorer. Most like 98 %. I'm quite sure bankers already have vaults full of PM stolen from banks. Those are prepared. Second people can be scared of confiscation. I live in Europe and am very cautious of that. And what about US citizens? At this place I'd like to thank Eric again for all efforts on creating this site. Yeah people will be left poorer in the short term but in the medium to long term they will be richer as they work for gold/silver which will be rapidly appreciating instead of the paper currency which will be rapidly depreciating. I understand most can not afford silver and gold or even acquire silver and gold because of supply constraints but there is still some silver and gold out there so I'm just telling those who can get some to take that little that is left. And the good news is even if you can't get any now, you will in the near future as you will be working and getting paid in gold and silver. Which will appreciate allot and give you an early retirement than you would have if you continued to get paid with the paper currency which has been depreciating for decades. Of course there will be some pain and hard work at first but the benefits will far out weigh the pain and work. Numonic....I don't understand your prosperous theory. There are finite resources in this world...obviously. The population is growing at a rate of greater than 80 million/year. Surely the concept of higher demand for resources will lead to increase in price, but that does not address sustainability. In essence, under your theory that gold value continues to appreciate, thereby creating prosperity, there are not infinite sources of food, water, shelter, medicine now for our planet's population....how could you possibly see this improving in the future by gold valuation???? Don't worry about confiscation. Here's why. The govt. and banks would love nothing more than for a glut of gold and silver to enter the market. Why? because this would bring the price of gold and silver down in relation to the paper currency. The thing is the only way to get more gold and silver on to the market is to mine more gold and silver. Unfortunately there is a cost to mining the gold and silver. That cost would raise the price of gold and silver which would defeat their purpose of mining more gold and silver. They need a way for more gold and silver to enter the market without anyone having to lift a finger to bring it there. Because it is this "lifting of a finger" that is the cause for the price of gold and silver rising. So what they do instead is to deplete the above ground silver and gold(the gold and silver that our ancestors mined) and they naked short the gold and silver market to hide the cost of mining the silver and gold. In order to naked short, you'd have to be able to give away dollars(the currency). Another unfortunate for the govt. and banks is that that ability to give away dollars(the currency) is going away as the enormous $1 quadrillion debt is deleveraging and the dollars(physical currency) in existance are all being called in to plug holes to stop defaults, as this same technique they used to keep the price of gold and silver down has been used on everything else in the world. This technique goes by the name of "credit" and it is price fixing. Credit has been keeping the price of everything produced lower than the true cost to produce those things. The task they had was to keep the price of everything low by using credit. It worked for some time with a few bumps(recessions) in the road but now it has reached a road block that it can not pass. The task of keeping every product in the world under the cost of production is too much and it has failed and now the true cost of production of many products will be exposed as the mask of "credit" is removed. The obvious reason they wanted to keep prices down was for the benefit of the currency, it was to make the currency look more valuable but in reality the cost of producing the currency is allot cheaper than the cost of producing many other things on earth. The conundrum was that in order for the banking system to continue, the currency had to be easy to produce, otherwise when defaults loomed from the massive debt that needed to be issued to assure trust in people to put their money in the bond/banks, the currency wouldn't be able to be produced fast enough to stop defaults and default is death to the banking system. The govt. and banks want to save the system of banking which is why they moved from using gold in banking to using only paper as gold was too difficult to produce to stop defaults and thus gold and banking would make a short life for the banking system where as paper and banking would keep the banking system alive much longer. Unfortunately for the bankers, even the seemingly easy to produce paper currency becomes too difficult to produce when the debt reaches such a high level and thus the paper currency is unable to stop defaults. Fortunately for the world, the wealth that is burried in the earth is practically untouched because of how credit has had us just scratching the surface of the earth for it's goods and there is a bunch of wealth in the earth waiting for us to bring it to the surface. so celebrate the beginning of a prosperous world. My point is that we haven't even scratched the surface of what we can get from the earth because we have been living off of the top layer due to credit. Credit hasn't been depleting the resources of the earth, it has been depleting the earth of producers. Thus everyone is trying to consume what has already been produced and production has been shrinking not increasing. It's almost as if everyone on the planet took a vacation from earth and went to visit another planet and took what was already above ground on earth. We depleted that above ground supply but the earth for decades remained practically untouched. I'm not advocating a gold or silver standard, I'm just saying at the moment they are in position to do better than any other store of value. If gold and silver become too rare or too abundant people should and will move to the next best asset to store there wealth. I'm just saying that credit has kept the earth practically untouched so I believe there is allot of resources waiting in the earth to be dug up and brought to the surface. I don't buy the idea that we are running low of earth's resources. I believe we've been running low of people to bring up earth's resources to the surface and this now gives the appearance as if we have depleted the earth of it's resources when we really just depleted the earth of it's producers. The assumption of the article is monetary base is growing because banks prefers to hold money on their account at the fed instead of using it for loans to other banks, firms, individuals or buying assets. But I do not understand that statement. When a bank make a loan to another bank, the amount of the loan go from her account at the fed to the account of the other bank at the fed. So, an inter-bank loan does not affect the monetary base aggregate. When a bank make a loan to a firm or an individual, the amount of the loan go from the account of the bank at the fed to the account of the bank of the firm/individual at the fed. So, a loan does not affect the monetary base aggregate. When a bank is buying an asset, the amount of the buying go from the account of the bank at the fed to the account of the bank of the counterparty at the fed (could be directly a bank or a non-bank). So, I do not see case where an activity of a bank could have an impact on the monetary base aggregate. As I understand, monetary base is only managed by fed activities. When the fed is doing a loan to a bank, it create the amount of the loan as monetary base and put it on the account of the bank at the fed. The operation from fed balancesheet perspective is : the collateral of the loan as asset of the fed, and the new base money as liability of the fed (banks accounts at the fed are liabilities of the fed). 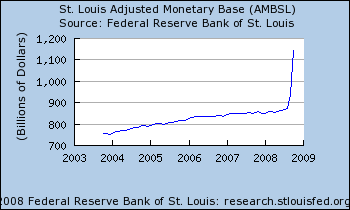 When the fed is buying an asset, it create the amount of the buying as monetary base. So, I do not understand all the story about "banks are holding reserves". If I'm wrong somewhere, please give me your lights. "Taxpayers are not the ones paying the interest on these deposits. The Fed is...."
Where do you think the Fed earns profits from?! ...mostly from interest on treasuries which is paid by our the government, and the government gets the money from you through taxing. The Fed has to return all profits after paying operating expenses and dividends to member banks back to the Treasury. Now less of this profit will go back to the Treasury and instead go directly into private banks. Only an idiot would believe the press release from the Fed that this is being done to help set a lower bound on the Fed Funds Rate. In a matter of weeks the spread was quickly increased from 10/75 basis points below the Fed Funds Rate for required and excess reserves respectively to being directly set by the Fed to the same as the Fed Funds Rate of 25 basis points even though the official target is 0-25 basis points. If the current target is 0-25 basis points why would you be worried about a floor!!!! HELLO ANYBODY HOME?? HE IS PAYING THIS INTEREST AS RANSOM FOR THE BANKS TO HOLD THE 800 BILLION IN NEW MONEY THE FED CREATED WHEN IT BOUGHT ALL THE TREASURIES AND MORTGAGE SECURITIES AND IS USING YOUR MONEY TO DO IT. This is only going to get more expensive from the over 2 billion a year currently being paid as interest rates on reserves will only go up to persuade banks not to invest in more lucrative investments, dumping their money into the market. It's so obvious. The Fed said they need this new program right now and not in 2011. Within days of the Oct. 3 2008 announcement of interest payments on all reserves the Fed began the massive increase in the money supply to double it to 1.6 trillion in a few months. This coordinated perfectly with a massive rise in excess reserves to the tune of exactly the 800 billion of newly created money. Excess reserves have historically been virtually 0. Now all of a sudden they are 800 BILLION and this is just a cute anomaly!!! The only other time in history there has been a notable rise was after 9-11 and this was only about 20 billion, which subsided the next month. Americans now officially pay a banker tax to private banks, and if they don't they will get hyperinflation. If you have seen all this obvious information and still hold on to dollars you are a moron. This system is coming to an end and this is just a cheap circus trick by the Fed to keep it going a little longer. The spending of government is only increasing to record levels and nobody wants our treasuries anymore. We are about 1 or 2 moves from checkmate. The only way to sop up this money is for the Fed to sell treasuries and securities, I think we all know that ship has sailed. Good luck selling treasuries when the government is conducting record deficit spending and China has had enough. Good luck selling junk toxic mortgages. In the meantime make sure you pay your banker tax.